A program of spontaneous composition and performance by an ensemble of highly-accomplished instrumentalists and composers. Chris Lough on double bass; Herb Robertson on brass, percussion, and vocals; Fred Taylor on drums and percussion; and Adrian Valosin on second drum set. The double CD set is a two-and-one-half-hour extravaganza of spontaneously-composed and performed sound. At times meditative, other times whimsical, and still other times stunningly cacophonous, the recordings reflect the height of the art of true collective improv. It is truly 'music of the moment'. As professional musicians, we operate almost wholly within constraints of style and ever-changing popular tastes in order to derive material sustenance from our efforts. This is one way we occasionally break free of these constraints. We sincerely hope that you enjoy the results. 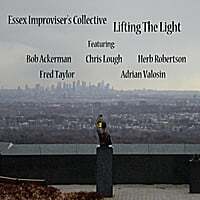 'Lifting The Light' was recorded and produced by Fred Taylor at Ivy House Studios East in Irvington, New Jersey and mixed at Ivy House Studios in Mukilteo, Washington. It was mastered by Rick Fisher of RFI Mastering in Seattle, Washington. Bob Ackerman started playing saxophone at age nine in New Jersey. Educated at Columbia University, he studied privately on woodwinds with Joe Allard, composition with Arthur Murphy, and classical flute with Tom Nyfenger and Alan Winkleman and most recently with Keith Underwood. He has worked with such diverse artists as Phillip Glass, Steve Reich, Joe Morello, and Chet Baker. A prolific composer, Bob has received Ford Foundation and National Endowment grants for his writings, and has just released a two-disc CD of compositions for orchestra, woodwind and jazz ensembles. Chris Lough began his studies with the late guitarist Harry Leahey, and studied at the Juilliard School and the Manhattan School of Music with Harvie Swartz. He has recorded for Leo Records and Cadence Jazz Records with trumpeter Herb Robertson, and has performed with Robertson's groups (which have notably included Gerry Hemingway, Mark Helias, and Steve Swell), and has been featured on many independent recordings as a sideman, composer, arranger, and producer. Over the years Chris has worked with a host of jazz greats, a handful of whom includes Adam Niewood, Eliot Zigmund, Ralph Peterson, and the late Jaki Byard. Herb Robertson became active as a member of the New York City downtown improviser's scene in 1980. He has since traveled the world playing in jazz and creative music festivals. Herb has toured extensively as a musician and leader throughout the USA, international clubs and other related venues. Herb brings a special kind of modern lyricism through his trumpet and other wind-type instruments, having influenced a younger generation of trumpeters and other musicians alike. He has recorded extensively and can be heard on many CDs, radio and tele-broadcasts. Fred Taylor has worked extensively nationwide as a leader and sideman, and for many years has been a fixture on the Seattle music scene. He has four albums to his credit as a leader; “Court of Circe” from 1982; “Processional”, with the fusion group Inquest in 2006; “Circling”, with Bob Ackerman and Rick Crane in 2008; and “Live At Cecil’s”, with the same trio in 2009. All of these recordings have received extensive airplay and editorial praise. Fred studied piano with Rosalyn Moldenhauer at the Spokane Conservatory; drums and percussion with Fred Hartley, Joe Field, and David Stetler; composition and arranging with Ralph Mutchler at Olympic College; and drumming and Afro-Cuban percussion with Kim Plainfield, Pat Petrillo, and Vince Cherico at the Drummer's Collective in New York. A short list of musicians with whom Fred has worked includes Jimmy Witherspoon, Ferlin Husky, Dianne Schuur and Gary Peacock. Adrian Valosin studied drawing and painting from age 7, and music from age 14 . He was trained in modern classical composition by composer Joel Thome, studied drums with Joe Morello and South Indian classical music with Padma Srinivasan. He played in the critically acclaimed jazz trio led by former Ornette Coleman guitarist Bern Nix. Adrian was Artist-In-Residence at Carnegie-Mellon University from 1987-88 where he taught drum set and improvisation. His composition “Stern Reisen” for solo piano won honors in the International World Music Days competition. The list of musicians with whom he has played includes Oliver Lake, Leroy Jenkins, Roy Campbell, and Jack Six.